UMP | University of Minnesota Press Blog: Peter Paik's politics of catastrophe—as revealed in The Matrix films, superhero comics, and other science fiction. Peter Paik's politics of catastrophe—as revealed in The Matrix films, superhero comics, and other science fiction. 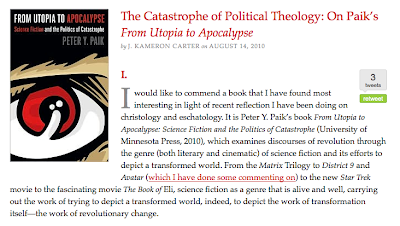 Scholar J. Kameron Carter looks at the problem of political theology as he sees it within Peter Y. Paik's book From Utopia to Apocalypse: Science Fiction and the Politics of Catastrophe.